I just accepted a position in downtown Brooklyn. I will be your BK “reporter” once this starts to take off. They (SHOP) have refined this design well: modern, yet still retaining a ‘classic architecture’ appearance. The building now has many design elements that evokes classic NY Architectural icons such as the Empire State building, Chrysler Building, and the Woolworth building. This is setting a good president for future towers in the area; we don’t want Downtown Brooklyn to start looking like Downtown Dallas - any town USA. I am feeling the love here on Yimby - this forum is a vast improvement over Wired New York. Sorry Edward if your reading this, just keeping it real my friend. Long live YIMBY, always something fun and interesting to see and learn. I think one of the reasons WNY did not last is because it was overly ‘moderated’ by overly zealous volunteer mods: that and a few other glitches led to its eventual demise. Anyway, I digress - this tower here on DeKalb Avenue is an Architectural masterpiece. Ground work still being done. Such a shame this building will be sharing the block with Junior’s (the most overrated desert place in the city). Want good cheesecake? Instead go to Veniero’s on 11th St between 1st and 2nd. These guys could have sold to JDS but chose not to even sell air rights if I recall. So they’re staying in their eyesore with that awful billboard in perpetuity. It’s Character, isn’t that what makes Brooklyn ‘cool’? This tower is nice and iconic but so many other new ones in the area might as well be in Denver or some random US city. Nothing unique or interesting about them. I like the older render much better. Both are great, though. Some like the Brooklyner, are actually much worse than anything you will find in other U.S. cities. Haha. Oh man that’s one is bad. I think LIC’s skyline looks better and more cohesive than Brooklyn’s. Downtown Brooklyn seems to have a real mishmash of facades that clash. Like the blue checkered AVA DoBro - or whatever it’s called. It’s sorta like the East/West sides of One57 and sticks out in a bad way. I think the only cure for Brooklyn’s skyline is to just keep building a ton more buildings and hope the uglier ones get lost in the zoo. The Brooklyner is the most atrocious thing built in the downtown skyline. It’s quite obvious the developers didn’t care for aesthetics, just a money grab. It’s an eyesore and looks very odd standing next to AVA DoBro which also looks out of place. Downtown Brooklyn has so much potential but I agree it’s way behind LIC and Jersey city. Hopefully 9 Dekalb sets a precedent for what’s expected going forward. A couple days ago. The hole seems to be getting a bit bigger and takes up most of the site. Maybe 10 feet deep so far. I much prefer the old render, especially the gothic ornamentation tapering at the crown. Anyone ever think this looks a bit like Isengard from Tolkien’s Middle Earth? 3 years seems like a lot for a skinny residential tower. Le sigh. Top out in 2 maybe? 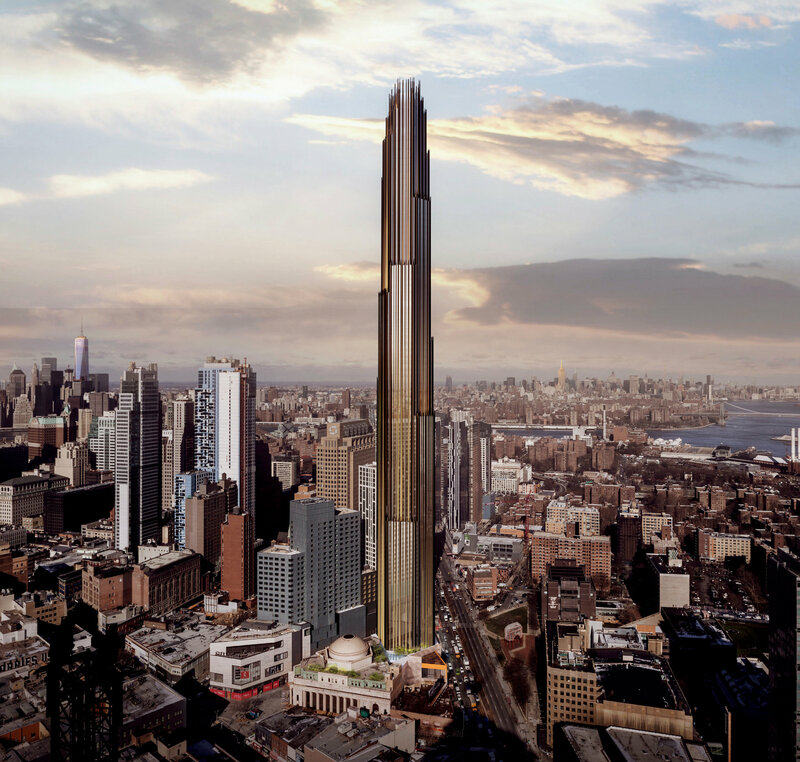 The new tower, which is expected to be completed in 2022, will be deferential to the landmark, but not derivative, said Gregg Pasquarelli, a principal at SHoP Architects, the designer. The hexagonal geometry of the building, seen in its ornate tile and coffered ceilings, will be echoed in the shape of the new structure.